Healthy January stops here as the annual fruit and veg marketing budget runs out. £296.6 million gets spent on confectionary, snacks, fruit, veg and soft drink marketing in the UK each year. But when was the last time you saw a humble carrot ad? That’s because only 5% of that total is allocated to fruit and veg. That means by the 19th January the total commercial marketing spend for fruit and veg could be used up. To highlight the gap in marketing budgets, renowned food campaigner Hugh Fearnley-Whittingstall has joined forces with the Peas Please initiative to get a new Veg Ad Fund off the ground to tempt us into eating our veg. This initiative is also supported by Edinburgh’s City Council leader Adam McVey and is backed by Food Standard Scotland. While restricting junk food advertising is critically important in tackling the nation’s unhealthy eating habits, the shortage of commercial vegetable advertising and its potential influence on our healthy food choices urgently needs addressing. The Peas Please initiative is marking the launch of the campaign for a dedicated Veg Ad Fund by announcing the winner of its vegetable ad competition organised last year. 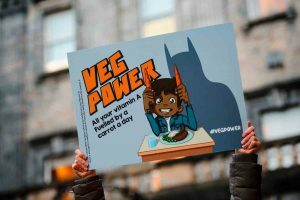 A dedicated Veg Ad Fund, made up of contributions from the Government, retailers and producers would enable vegetables to receive marketing investment that will see veg advertised compete with branded chocolates, fast food outlets and soft-drink firms. Today, the Edinburgh Royal Mile skyline will have a special look, as Edinburgh City Council have allowed Peas Please to project the veg ad onto the Princes Street-facing side of the City Chambers today after sunset. The winning advert will also be displayed in over 5,000 other locations across the UK including another projection onto Cardiff City Hall, in Co-Op stores nationwide, park notice boards across Glasgow, advertisement spaces in Dundee City Centre, a co-op in the Outer Herbrides, and many more local communities and thousands of primary and secondary school canteens across the UK.